Above: Baylor Pass in the Organ Mountains, outside of Las Cruces. Photography by Laurence Parent. The Trailhead: Go about 15 miles NE of I-25 in Las Cruces on US 70-82. After driving over San Augustin Pass, turn south onto the well-marked Aguirre Spring Recreation Area road. Follow it 5.9 miles to the marked trailhead just before the campground entrance. 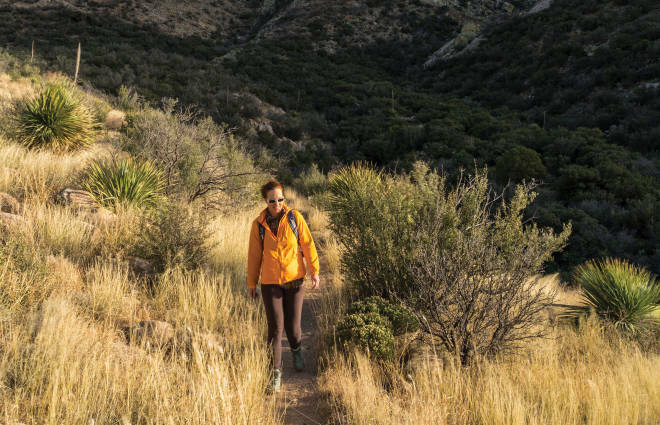 What You&apos;ll See: Noted for rocky spires that resemble organ pipes, the Organ Mountains rise more than 5,000 feet above the Río Grande Valley and are part of the Organ Mountains–Desert Peaks National Monument, overseen by the Bureau of Land Management. From the trailhead, the path climbs steadily, winding through occasional boulders and rock formations. Check out the views along the way. You’ll hit Baylor Pass at about 2 miles. From there you can see down into Baylor Canyon and a little of the Río Grande Valley beyond. The west side of the mountains you see from here is much more dominated by desert vegetation. Return the way you came or tack on another 4 miles to the west trailhead (leave a second car about 1.9 miles S of US 70-82 on Baylor Canyon Road).